From the opening credits it’s clear that this is a film sprung from the mind of a supremely creative individual; the key names are written in chalk on a blackboard, a clapper loader calls the shot, from somewhere off screen we hear a voice call ‘Cut!’, then we read the words of Jean Cocteau asking for some “childlike simplicity” in order to believe, among other things, that “the hands of a human beast will smoke when he slays a victim”. Agreeing to the contract, we enter into the magical realm of La Belle et La Bete, the director’s interpretation of Madame Leprince de Beaumont’s classic French fairy tale. Following a fate not dissimilar to that of Cinderella, the kind-hearted Belle (Josette Day) is delivered from servitude into royalty through a monumental sacrifice. Her two arrogant sisters and her foolhardy brother squander away the family fortune when all she wants is a simple rose. But when her father plucks one from the Beast’s garden, he must pay for it with his life – or that of one of his daughters. Naturally Belle offers herself up and enters the Beast’s enchanted castle where human arms act as candelabras and carved stone statues observe every slow motion move. 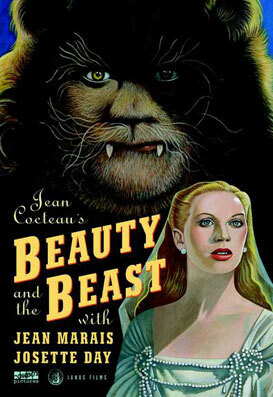 It’s a wonderfully surreal environment made even more intriguing through the presence of the Beast, a fantastical furry creature inhabited by Cocteau’s lover Jean Marais who also plays the part of Belle’s handsome suitor Avenant. Repulsive as he appears, the Beast soon touches Belle with his loving nature. And as a reward for seeing beyond the surface to the soul below, Belle is delivered into the arms of the handsome Prince (Marais again). But such is the powerful charm of this film that we’re left pining for his previous incarnation as the poor tormented Beast!